Alot of midpricers in that team with some nice pods as well. Obviously there is a risk of ending the season with alot of guys that arent in the top 10 in their position with this strategy. Looking at this team I think you have 8 definite premiums with another 8 or so possible keepers. I would want to change that to have 12-13 premiums and 2-3 possible keepers. In saying that all selected players have some serious upside if they pay off. Good Luck for the season mate. Only pick i find super strange is the Luke Ryan pick. Few great picks (love Witherden, Coniglio). Just think theres probably a few too many mid-pricers, which means that you've compromised a top shelf premo down back. Not a bad first up team. As has been said a lot of mid pricers in the k$350/500 range that is effecting overall balance. Question to ask for example is someone like Ryan going to finish Top 10 in Defence to say Yeo. If you start with someone who you think will definitely be Top 10 then trades saved especially if they are the players you have to bring in down the track. Another suggestion as well with Silverlions above is downgrade Dahlhaus or Lobb to get extra cash for upgrades as well. Looks pretty good man. Not sure about Armo and Conca though. Depending on how much cash you have in the bank, a def rookie + premo mid could be better there. Much improved and well done. Not100% sure on Conca or McLean and Maybe Armitage being the prems you need. You can downgrade and upgrade there. remember though it is your team so do what you feel best. downgrade Conca to Richards, upgrade Armitage to player of your choice. This. Though the side's structure is much improved from the original. 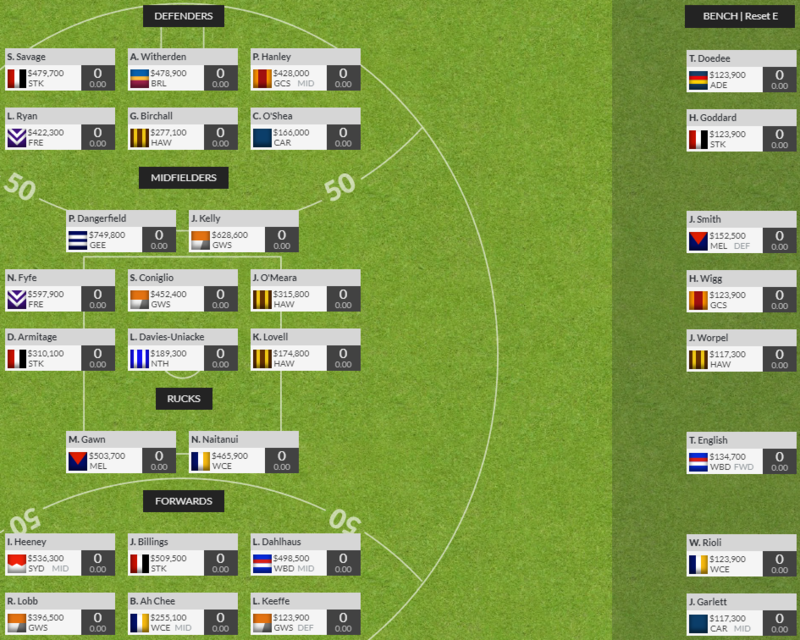 Only player I'd be considering in the DEF around Conca's price is Brayshaw, and he also comes with a lot of risk. Same goes for Armitage.